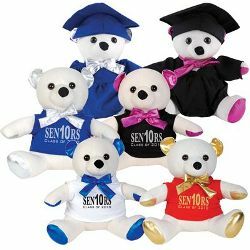 31cmH sitting calico signature / autograph bear with satin graduation gown (removable velcro opening) and mortar board (fixed). Graduation gown can be embroidered. ITEM SIZE(MM) Sitting 310H, Standing 390H, Hat 175Diagional, Gown 30L (sleeve to sleeve) by 180H. PRINT AREA(MM) 60L x 30H, 55Dia. GRADUATION GOWN / MORTAR BOARD Black. MATERIALS Calico Outer / Polyester Fill / Satin Gown and Hat.